Chor Bazaar is one of the largest flea markets in India, located near Bhendi Bazaar in Kamathipura, South Mumbai, The area is one of the tourist attractions of Mumbai. The word chor means thief in Marathi and Hindi. According to popular legend, if you lose anything in Mumbai you can buy it back from the "Chor Bazaar". The market has been mentioned in popular novels, including Rohinton Mistry's Such a Long Journey, where it is described as "not a nice place". In modern times, Chor Bazaar is said to sell mostly second-hand goods rather than stolen goods. The market is now famous for antique and vintage items. A store called Mini Market offers old Bollywood posters for sale. Others offer authentic Victorian furniture, replacement parts for automobiles, etc. Although bargains are sometimes staggering, haggling is considered mandatory. This is basically an "organized" flea market, where one has to rummage through junk to find what one wants. Street food of Mumbai is the food sold by Hawker trade hawkers from portable Market stalls in Mumbai. It is one of the characteristics of the city. The city is known for its distinctive street foods. Although street food is common all over India, street food in Mumbai is noted because people from all economic classes eat on the roadside almost round the clock and it is sometimes felt that the taste of street food is better than restaurants in the city. Many Mumbaikars like a small snack on the road in the evening. People of Mumbai cut across barriers of class, religion, gender and ethnicity are passionate about street food. Street food vendors are credited by some for developing the city's food culture. Street food in Mumbai is relatively inexpensive as compared to restaurants and vendors tend to be clustered around crowded areas such as colleges and railway stations. Zaveri Bazaar is a jewelry market and a major hub for B2B jewelry industry in Mumbai, India. Located at Bhuleshwar in South Mumbai, just north of Crawford Market, Zaveri Bazaar is a muddle of narrow lanes, dotted with hundreds of jewelry shops that sell gems and jewels, notably Tribhovandas Bhimji Zaveri (TBZ), Dwarkadas Chandumal, Dhirajlal Bhimji Zaveri & UTZ. 65% of all gold trading and dealing in India is estimated to originate from the market.During the early 19th century a jeweller named Ambalal Zaveri was very famous for his great quality of gold, due to his death his great reputation slowly collapsed due to disputes between his sons. Bhendi Bazaar is a market in South Mumbai. The origin of the name is that the British residing to the south of Crawford Market in Fort, referred to this area to the north of Crawford Market as "Behind the Bazaar". The natives picked this as "Bhendi Bazaar". Bhendi Bazaar occupied an area between Mohammed Ali Road and Khetwadi. Mini Kerala in Mumbai. The closest Central and Harbour railway station is Sandhurst Road, and the closest Western railway stations are Charni Road and Grant Road. The bazaar is popular for shopping viz antique items, hardware items. The market is a very critical part of Indian society. It is a place where people meet to gather their requirements for the coming days as well as build relations with one another. Everyone entering the market has their own set of designated vendors that they trust and go tot to only . The Indian warmth will not be felt without the presence of a market. The idea behind this specific Mumbai tour is to give a taste of the warm Indian market. The streets and alleys buzzing with life and brimming with activity and livelihood. 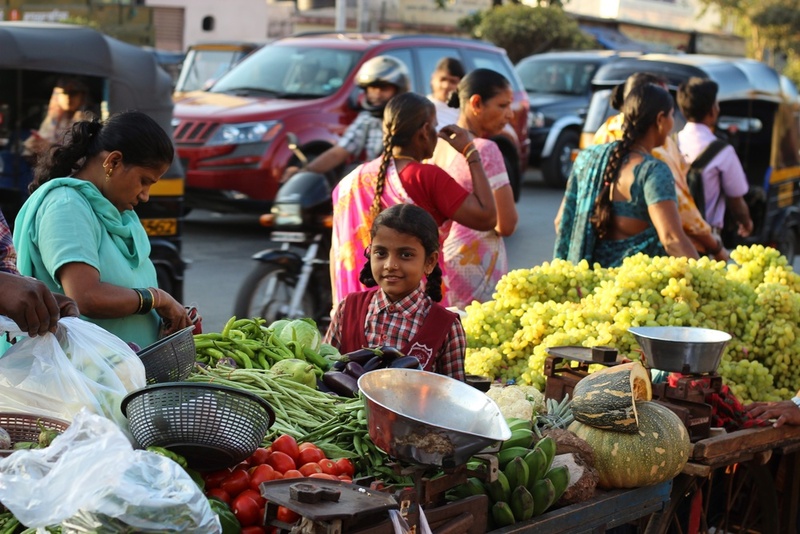 Markets in Mumbai are where the life is and this tour will give you an idea of life in the Bombay's streets. Private Tour: 7,200/- Rupees.You can bring a maximum of six people on your private tour. CRAWFORD MARKET: This Romanesque & Gothic architecturally styled building was built during the English rule of India and houses a whole sale, fruit and vegetable Market. Crawford Market is also famous for its sales of exotic animals which is also a huge market by itself! MANGALDAS MARKET: In other words this is the market of fabrics. India's elite fashion designers purchase their necessaries for their creations here! KALBADEVI AND KHAU GALLI: Known specifically for their tangy treats and chaat masala dishes as well as a long list of Indian must have. Khau Galli is definitely a place to halt and fill yourself to the brim with all you can eat and just too easy on the pocket. MUMBADEVI TEMPLE: Mumbai city has got her name from the goddess Mumbadevi, this is the historical Hindu temple. Here is a place of reverence where prayers and honest petitions are answered by the All knowing. FLOWER GALLI: Flowers have great significance in Indian tradition and culture hence used on almost all occasion. You will find flowers everywhere in this country; in temples, taxis, homes, women's hair, and even for all kinds of worship. The Flower Galli market has been around selling these necessities to traditions for nearly 100 years! BOMBAY PANJRAPOLE: The cow in India is given the rank of mother as a lot of nutrition is given by her to not only her calves but also everyone interested. This is one of the oldest areas used for the welfare of cows. An estimate of over 400 cows live here! Since the cow is considered sacred by Hindu people to increase their karma, come to the shelter to feed the cows.